Sheila Palandjian, Gianfranco DiCicco and Colleen Bain. PALM BEACH, FL – Cocktails were poolside and a gourmet buffet-style dinner was served on the terrace as the Intracostal Waterway provided a stunning backdrop for an evening honoring major contributors to Dana-Farber’s annual Discovery Celebration. 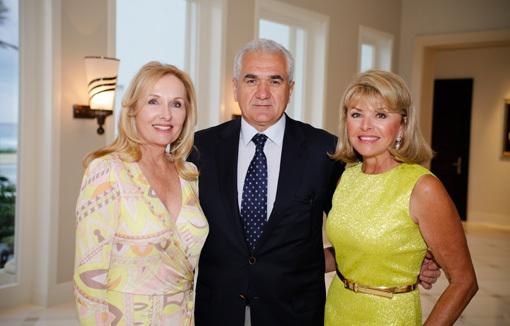 Long-time Dana-Farber supporters Nassrine and Norman Traverse opened their new Palm Beach home for the celebration. 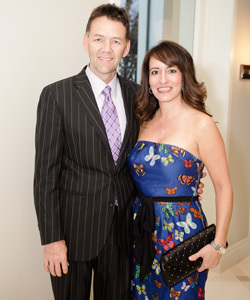 Guests enjoyed live music from a six-piece band throughout cocktails and dinner. 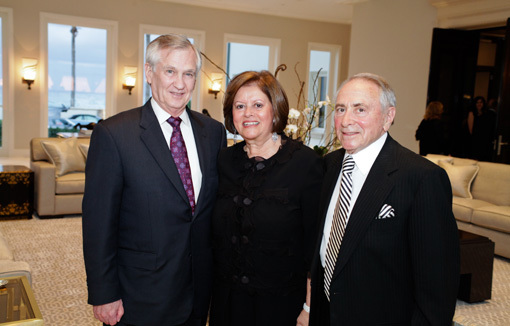 More than 55 supporters attended the evening on March 12, 2012, including Sandra Fishman, Vicki and Arthur Loring, Patty and Anthony Myura, Ronnie Nagler, Georgia Pappas, Jim Pappas, Hilary Rubin, Gilda and Alfred Slifka, Nancy Yanofsky, Marcia Yanofsky and Marie Zano. The 21st Annual Discovery Celebration to benefit Dana-Farber and the Jimmy Fund was held Feb. 18, 2012, at The Mar-a-Lago Club. More than 325 civic, business, and philanthropic leaders from south Florida and New England attended the program, entitled, “A European Gala & Musical Evening,” which raised more than $1.5 million for adult and pediatric cancer care and research at Dana-Farber. The gala was chaired by Melania and Donald J. Trump and featured international delicacies, desserts, dancing, and musical entertainment throughout the evening, including a performance from The Sultans of Swing. The Dana-Farber Cancer Institute is a principal teaching affiliate of the Harvard Medical School and is among the leading cancer research and care centers in the United States. It is a founding member of the Dana-Farber/Harvard Cancer Center (DF/HCC), designated a comprehensive cancer center by the National Cancer Institute. It provides adult cancer care with Brigham and Women’s Hospital as Dana-Farber/Brigham and Women’s Cancer Center and it provides pediatric care with Children’s Hospital Boston as Dana-Farber/Children’s Hospital Cancer Center.